The T100C is an economical general purpose conventional air spray gun for spraying a wide range of coatings. 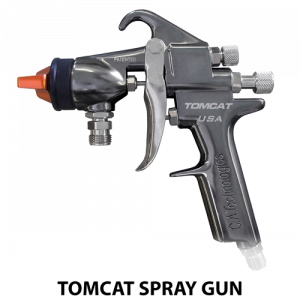 Designed for production use, the Tomcat is perfect for all coatings from thin to thick, stains to glue. Can also be used with internal mix nozzles as well as carbide tipped fluid nozzles for abrasives. 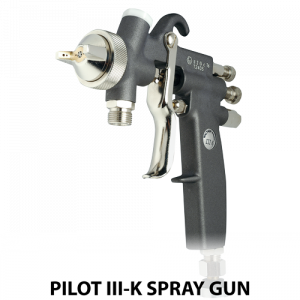 This gun features a self- adjusting needle packing, inexpensive nozzle replacement and rugged construction. Recommended for solvent based materials. The Tomahawk is a lightweight ergonomically designed,price competitive, high quality production sprayer. 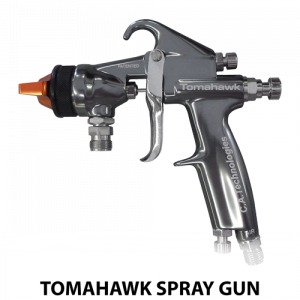 It is designed for the painter who wants a conventional gun for spraying a wide range of coatings from glue to fine finish…the Tomahawk can handle it all. Recommended for solvent based materials. 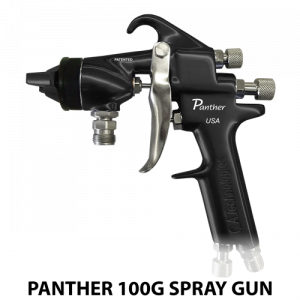 The P100G is a general purpose conventional air spray gun designed for glue/adhesive applications of all types. The body and air cap are teflon anodized for easy clean-up and longer life. Guns feature self-adjusting needle packings, inexpensive nozzle replacement and rugged construction. Both have all stainless steel fluid passages and Teflon anodized bodies and air caps. Recommended for solvent based or water based materials. 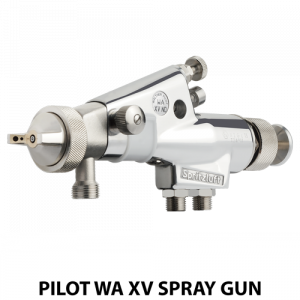 The PILOT WA 700-K is a fantastic all around automatic spray gun the is designed specifically for adhesive spray. Depending on the application required, the WA 700-K is available with internal or external control. It feature a front body and wetted parts made of stainless steel. 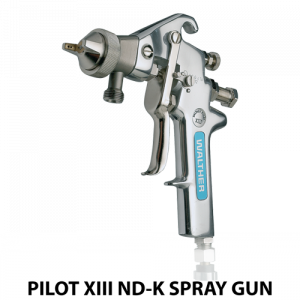 The adhesive spray gun also come with an optional pull-bar on the back for manual operation of the spray trigger for maintenance purposes. 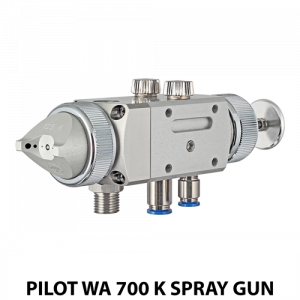 The WA 700-K also has a notch adjustment on the spray gun itself to regulate material volume. 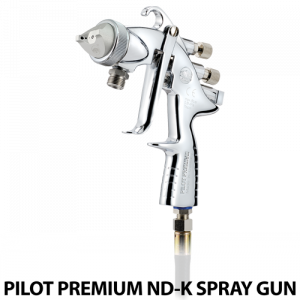 The PILOT Premium ND-K is a top-class spray gun designed for water-based adhesive spray. This spray gun features stainless steel wetted parts and a galvanized cast aluminum body. It also has larger than average material ports to prevent adhesive accumulation and an ergonomic design for both left and right handed users. 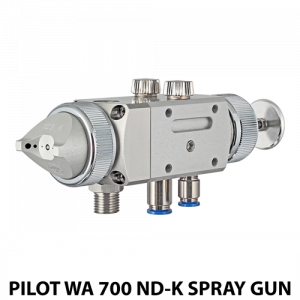 The PILOT WA 700 ND-K is a fantastic all around automatic spray gun the is designed specifically for water-based adhesive spray. Depending on the application required, the WA 700 ND-K is available with internal or external control. It feature a front body and wetted parts made of stainless steel. 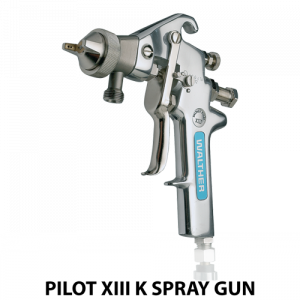 The adhesive spray gun also come with an optional pull-bar on the back for manual operation of the spray trigger for maintenance purposes. The WA 700 ND-K also has a notch adjustment on the spray gun itself to regulate material volume. WALTHER PILOT continues to solidify its status as a leader in the adhesive spray industry with the release of its newest two-component spray gun, the PILOT BOND 2K. 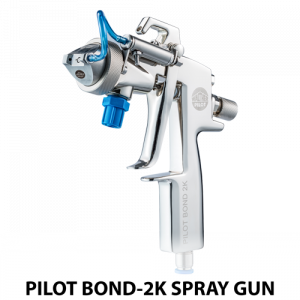 In addition to its top class PILOT III-2K two-component spray gun, the Bond 2K is a high-quality and cost efficient option for spraying multi-component adhesives. The PILOT Bond-2K features a compact design with a sturdy, ergonomic grip to reduce fatigue during extended usage periods and stainless steel material passages for the processing of water-based materials. The wide jet spray pattern can be adjusted for either vertical or horizontal spray. The B component is introduced through a horn in the air cap in order to provide optimal mixing and atomization. Engineering efficiencies have truly created a premium level piece of spray equipment at a cost efficient price. 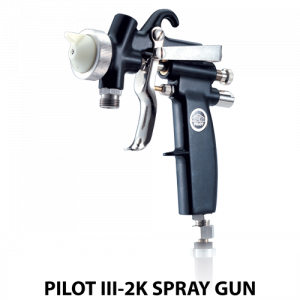 PILOT III-2K – The premier spray gun for spraying 2-component adhesives. It features a PTFE-coated gun body for easy cleaning and multiple nozzle sizes for both Component A and Component B.
Adhesive Spray Systems offer enormous advantages over traditional systems when working with all types of adhesives. Let our in house engineers help you pick out the best solution for your particular need that will maximize ROI and minimize repair costs.